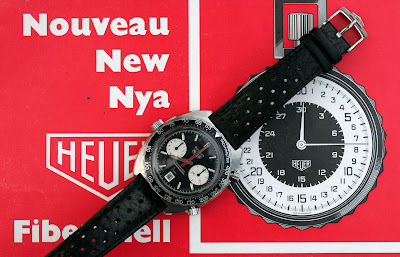 This is one of the best known Heuer chronographs, the 1163 Viceroy. 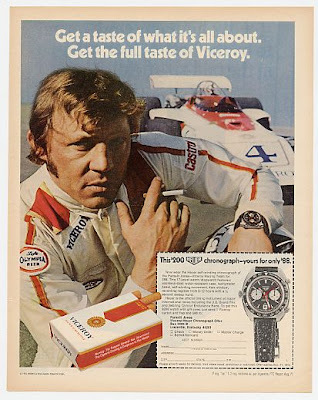 This version was produced as a promotional item for Viceroy cigarettes in the 1970's. 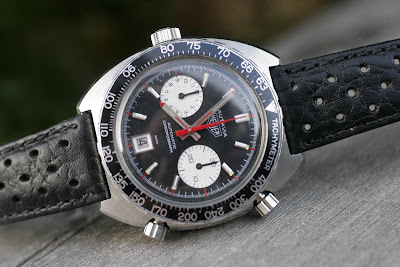 While the 1163T Autavia of the period was selling for $200, enthusiasts would buy the 1163V for $88 by sending in Viceroy coupons / proofs of purchase. The Viceroy model (Reference 1163V) is recognized by the tachymeter bezel, the economy dial with red dots by the applied markers and white elements incorporated into the markers, brushed steel hands with red tips and luminous inserts. This is one of the Viceroy adverts that promoted this very good deal. The case is standard 1163 with domed plastic crystal and pushers fully visible from front, and partially hidden from the back. 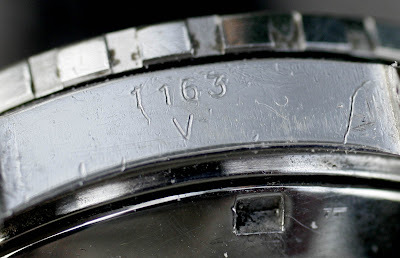 The case is stamped 1163 V between the lugs. Strap size is standard 20mm. The Viceroy was sold with a black rally strap. My Viceroy has the original vintage Heuer buckle. The originals is easy identified by the "sun" stamped on the back. The re-issue buckles from the modern Carrera and Monaco do not have this symbol. Fin blogg! Kjempefin Autavia, en sån vill jag också skaffa. Har du några tips vars man kan hitta en? Ska man passa sig för Ebay? Hei, det går an å finne fine Autavia på Ebay, men vær litt forsiktig. 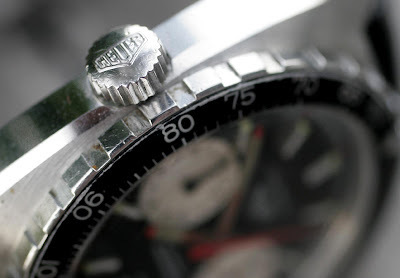 Spør gjerne om hjelp på Heuer forumet på www.chronocentric.com Du kan også kjøpe hos en proff selger som Nic på www.heuerboy.com , men det er ofte dyrere. Fordelen er at du får garanti.